On January 21, 2018, we will be celebrating the 100th Anniversary of the birth of the famous cellist, pedagogue and conductor, Maestro Antonio Janigro. Although born Italian , with his many years of musical activities in Croatia, Janigro had made invaluable contributions to this country and created generations of musicians, many of whom are now internationally acclaimed musicians. A concert dedicated to Antonio Janigro’s memory will take place in Zagreb’s premier concert hall, “Vatroslav Lisinski”. 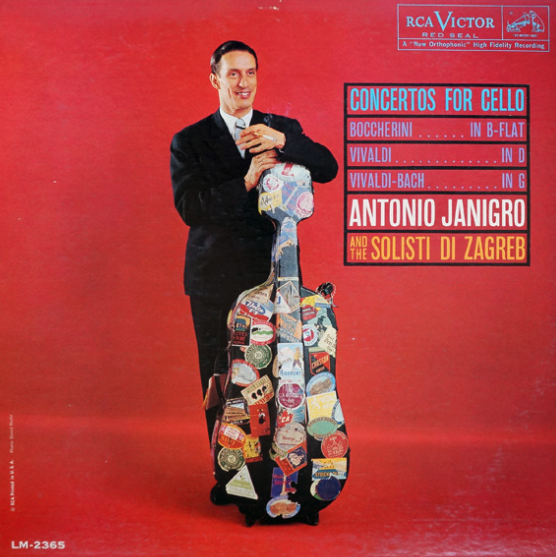 Antonio Janigro, in addition of being a world-renowned cello soloist and teacher, was also the founder of the Zagreb Soloists, a chamber orchestra that made him famous as a conductor as well. This ensemble has been the Ambassador of Croatian Culture for over 60 years. Janigro was also the founder of the Croatian Radio Television Symphony Orchestra. Naming a street or square after him is in progress by the Zagreb Street Naming Committee . 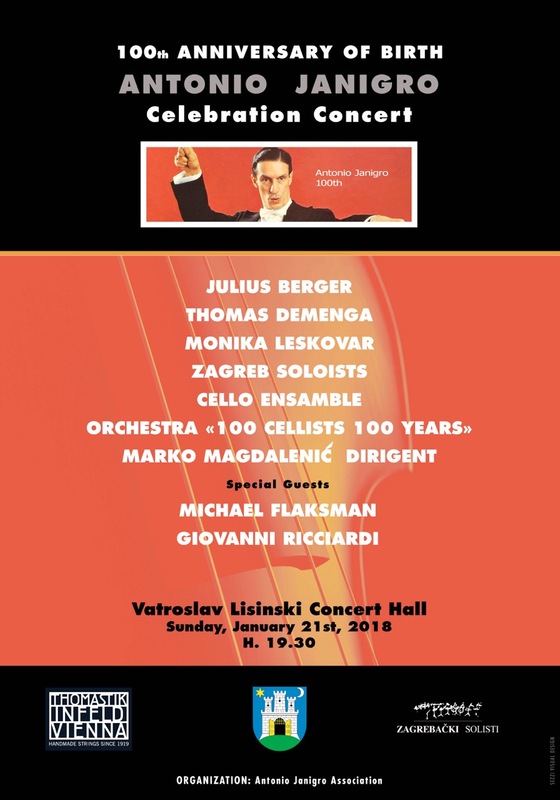 A concert will take place in the memory of Janigro in Zagreb’s premier concert hall, “Vatroslav Lisinski” and will be broadcasted by the local media. 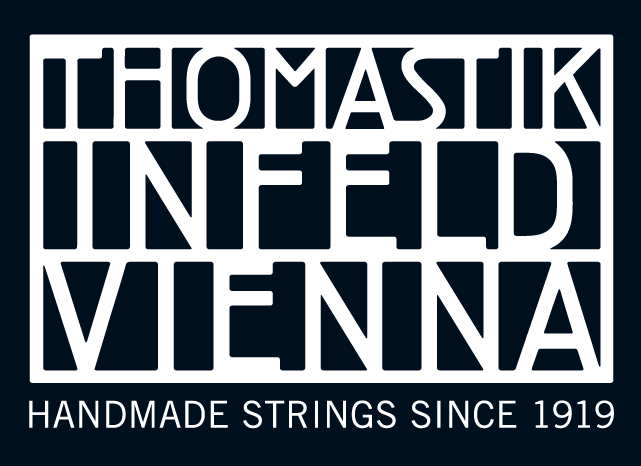 A special cello ensemble “100 cellos for the 100th Birthday” is going to be formed and will play for this special occasion. 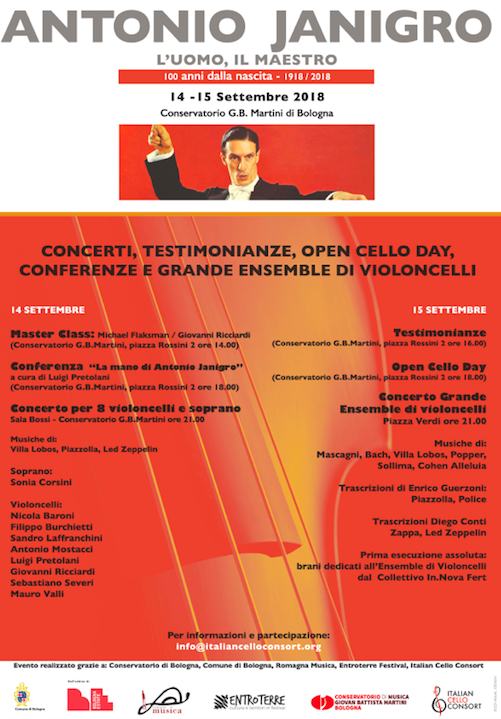 An another ensemble formed by the principals cellists of Croatian and Slovenian orchestras, internationally acclaimed cellists like Thomas Demenga, Andrej Petrač, Julius Berger, Michael Flaksman, Giovanni Ricciardi, Monika Leskovar, Thomas Burić and many other will play together for this celebration.